In "Bouquet Et Architecture Vertical" tapestry we see flowers on a balcony ledge and red drape. This exquisite floral tapestry combines flowers and architecture beautifully as we see the bouquet overlooking from a tall balcony scene. The red drape here represents beauty, and is an icon used in 18th century French tapestries to represent scenes where beauty is portrayed. An extravagant gold border with emblems in the corners completes this work. 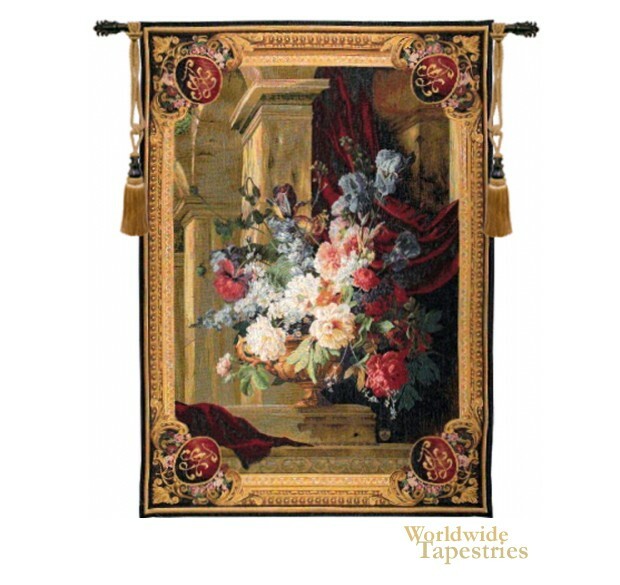 Full of exquisite beauty, this Bouquet Et Architecture Vertical tapestry is backed with a lining and has a tunnel for easy hanging. Note: tapestry rod, tassels and accessories, where pictured, are not included in the price. Dimensions: W 32" x H 43"
Dimensions: W 57" x H 77"